The rapid uptake of transcriptomic approaches in freshwater ecology has seen a wealth of data produced concerning the ways in which organisms interact with their environment on a molecular level. Typically, such studies focus either at the community level and so don’t require species identifications, or on laboratory strains of known species identity or natural populations of large, easily identifiable taxa. For chironomids, impediments still exist for applying these technologies to natural populations because they are small-bodied and often require time-consuming secondary sorting of stream material and morphological voucher preparation to confirm species diagnosis. These procedures limit the ability to maintain RNA quantity and quality in such organisms because RNA degrades rapidly and gene expression can be altered rapidly in organisms; thereby limiting the inclusion of such taxa in transcriptomic studies. Here, we demonstrate that these limitations can be overcome and outline an optimised protocol for collecting, sorting and preserving chironomid larvae that enables retention of both morphological vouchers and RNA for subsequent transcriptomics purposes. By ensuring that sorting and voucher preparation are completed within <4 hours after collection and that samples are kept cold at all times, we successfully retained both RNA and morphological vouchers from all specimens. 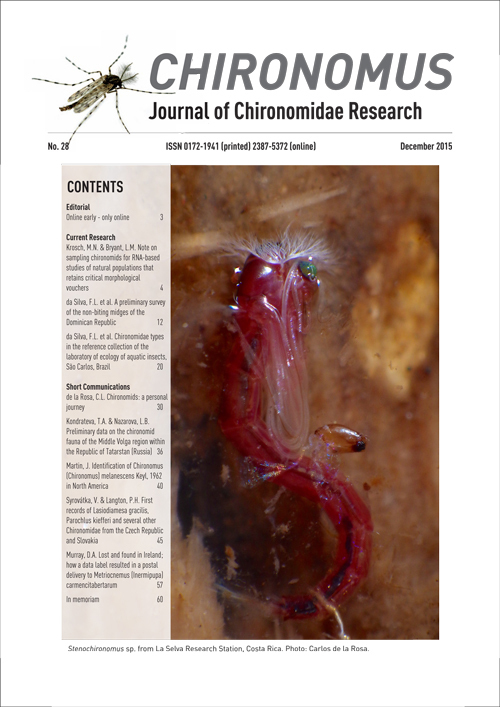 Although not prescriptive in specific methodology, we anticipate that this paper will assist in promoting transcriptomic investigations of the sublethal impact on chironomid gene expression of changes to aquatic environments.